Following her emotionally gripping box office hits Laughing in the Dark (2015) and Enough (2017), beloved best-selling comedian Chonda Pierce is set to return to the big screen in May with Unashamed. Presented by Fathom Events and Fuseic Entertainment and premiering in more than 1,000 cinemas nationwide for two nights—Tuesday, May 7 and Thursday, May 9 at 7:00 p.m. local time—Unashamed finds Pierce on a quest to explore the hearts and minds of some of the boldest believers in America. Tickets for Chonda Pierce: Unashamed can be purchased at FathomEvents.com and participating theater box offices. Endeared to fans around the world for her fierce wit and Southern charm, Pierce is also known for her unwavering convictions, a driving force behind Unashamed. The film features conversations with such personalities as former Arkansas governor and presidential candidate Mike Huckabee and authors/speakers/real estate entrepreneurs the Benham Brothers, as well as Michael Tait—frontman of GRAMMY®-nominated, Platinum®-selling Newsboys—and Dove Award-winning singer/songwriter Danny Gokey, among others. Both humor and wisdom abound as Pierce and her guests candidly share personal stories of speaking Truth to culture, no matter the circumstance. Chonda Pierce-Unashamed – Full Trailer from Fuseic Entertainment on Vimeo. Unashamed follows a string of box office hits for Pierce. Her 2015 award-winning Fathom Events/Fuseic Entertainment release Laughing in the Dark documented her life following her husband’s tragic death, seeing sellouts in more than 125 theatres around the country during its one-night cinema debut. Fathom Events/Fuseic Entertainment’s Enough followed in 2017, further examining Pierce’s journey to rebuild her life after loss. The latter was also a box-office hit, garnering the highest per screen average of all nationwide theatrical releases on the day of its premiere. 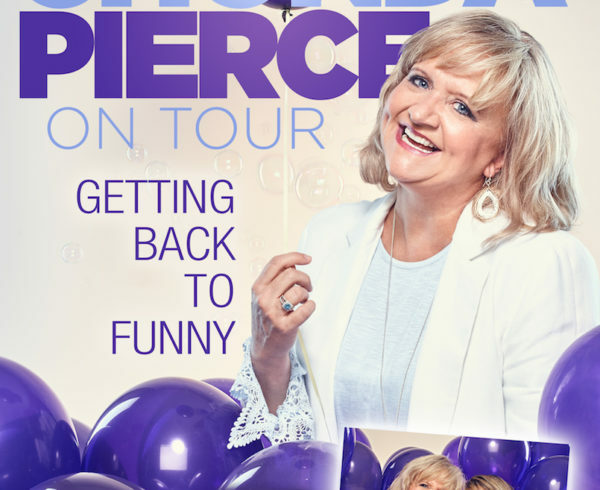 Pierce, who appears often on the iconic Grand Ole Opry, is currently bringing her signature wit to audiences around the country on the Chonda Pierce: Still Laughing Tour, featuring special guest Karyn Williams. The tour is slated to hit Indianapolis; Des Moines, Iowa; Fort Lauderdale, Florida; and Shreveport, Louisiana, among numerous other cities this spring. About Chonda Pierce: A stand-up comedian, television hostess, actress and author, Chonda Pierce has been making people laugh for more than two decades. With six Platinum DVDs, three Gold DVDs and five Daytime Emmy® Award nominations to her credit, she appears often on the internationally renowned Grand Ole Opry and is a regular contributor on TBN’s flagship weekly broadcast, “Huckabee.” Pierce is the Recording Industry Association of America’s (RIAA) best-selling female comedian of all time and has been ranked among Pollstar’s top-selling live performers. About Fathom Events: Fathom Events is the leading event cinema distributor with theater locations in all top 100 DMAs® (Designated Market Areas) and ranks as one of the largest overall theater content distributors. Owned by AMC Entertainment Inc. (NYSE: AMC); Cinemark Holdings, Inc. (NYSE: CNK); and Regal Cinemas, a subsidiary of the Cineworld Group (LSE: CINE.L), Fathom Events offers a variety of unique entertainment events in movie theaters such as live performances of the Metropolitan Opera, top Broadway stage productions, major sporting events, epic concerts, the yearlong TCM Big Screen Classics series, inspirational events and popular anime franchises. Fathom Events takes audiences behind the scenes for unique extras including audience Q&As, backstage footage and interviews with cast and crew, creating the ultimate VIP experience. Fathom Events’ live Digital Broadcast Network (“DBN”) is the largest cinema broadcast network in North America, bringing live and pre-recorded events to 1,010 locations and 1,628 screens in 182 DMAs. The company also provides corporations a compelling national footprint for hosting employee meetings, customer rewards events and new product launches. For more information, visit fathomevents.com. About Fuseic Entertainment: Director Rick Altizer and producer Kent Songer launched Fuseic Entertainment in 2002 as a developer of proprietary music, animation and film projects that encourage, edify and strengthen faith and belief for individuals and families. Fuseic Entertainment’s Chonda Pierce: Laughing in the Dark took home the Documentary Feature trophy at the 2016 Park City International Film Festival in Park City, Utah. For further information visit fathomevents.com, chondamovie.com or turningpointpr.com.